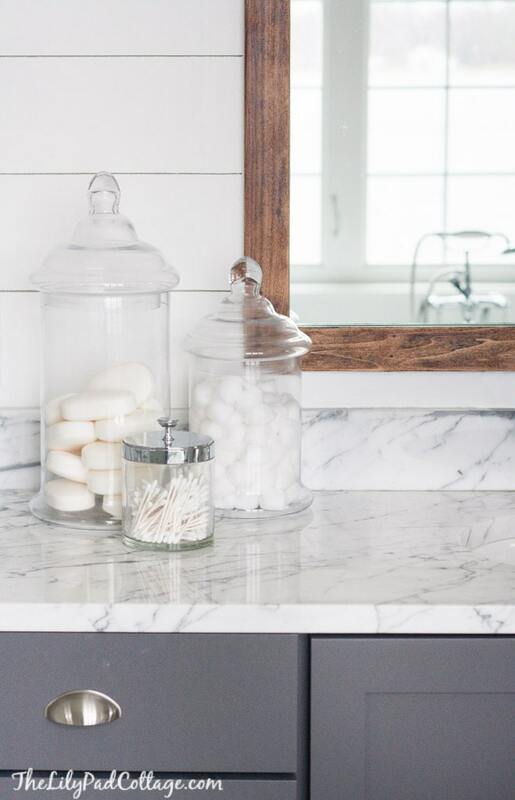 I hinted last week that (ok it was two weeks ago… last week was a crazy one and I didn’t blog) there was a story behind the master bath refresh. Like all good projects in our home, the Mr. was not, let’s say “enthused” about redoing our lake house master bath. I get it, there really wasn’t anything wrong with it, but it also didn’t fit in great with the rest of our home. I had always wanted to go back and tile the back wall or do something to it, because it just felt a little blah. I started sketching out ideas and settled on planking the back wall to look like ship lap. I’d been thinking of this since August, and the Mr. being the Mr., mandated that I wait until October to tackle this because (a) our September was nuts and tackling a big remodel project would not help that level of crazy and (b) I think he thought I would change my mind or forget about it. HA HA HA, oh no, my friend, this mind is a steel trap! Well, at least when it comes to obsessing over home decor ideas anyways. It just so happened the Mr. had to travel to Atlanta the last week of September…hmmm, really one whole week without the Mr. here to complain that I’m wrecking our house? And it just so happens to overlap October 1st?! I mean, you can see what’s about to happen right?! His flight left Saturday afternoon and that Saturday night I spent ripping out all the drawers and painting the cabinets. Things were going great – I was totally going to make this thing happen before he came home. Monday it was time to get started on the planked walls, so I drove to 3 different home improvement stores to get underlayment 4 x 8 boards to have them cut into 6 inch strips and every store I stopped at their saw was broken! I persevered and drove over an hour away to grab these boards, such was the level of crazy I had reached. We still got this, (we being me and you, all collectively cheering me on in my head)…and then Tuesday morning hit with an unholy mix of pink eye, bronchitis, raging ear infection all wrapped in one sad package – me. I… WILL… PERSEVERE! You’ve never quite seen such a hot mess as me in my pajamas with one eye crusted shut, coughing up all matter of grossness with a nail gun in one hand and a box of kleenex in another. Simultaneously cursing the Mr. for being gone at this point and also thankful he wasn’t here to witness the poor life choices I was making… but – the plank wall got done! Wednesday I took a pit stop at my Dr. office for antibiotics and to throw some macaroni and cheese at my poor neglected children. Thankfully he loved it, and as usual thought I was totally off my rocker for tackling it all while I was half dying and he was out of town, but sitting in my tub coated in vicks vapor rub trying to steam my lungs whilst staring at my new beautiful bathroom made it all worth it. I’m still shopping around for a few accessories, so it’s not quite done but I love the new planked wall. I also sanded the mirrors down and found out they were a gorgeous walnut that somehow got painted instead of stained. I stained them to match these cute hooks I picked up from Target. The Mr. has some sort of condition where he is unable to hang up his towel (my kids also suffer from this ailment), so I thought hooks would be easier on his impairment. The jury is still out on that one, but like him, they sure look cute! I’ll share my little lighting update trick later this week and then my Christmas gloves are coming off, so be prepared for lots of Christmas decor coming your way! For more info on how I turned these basic builder cabinets into a more custom look click here. My bathroom is literally torn in half right now and I couldn’t decide if I wanted to go through the trouble of planking the wall behind the sink…..this pretty much seals the deal!! I LOVE how it turned out!! Oh can’t wait to see what you do Ashley!! Oh my god beyond gorgeous. How you did it I’ll never know. I get bronchitis all the time and I know how awful you feel. It really compliments the rest of your beautiful home. You are one lucky girl.. Congrats on a gorgeous bathroom!! Girl, you are a rockstar. That shiplap wall has me all googly eyes. And the frames, hooks, and lights are icing on the cake. Love, love, love, love, love. Okaybye. Thanks Sarah love, love, love back! I had to chuckle when you mentioned that your husband wasn’t enthused about doing more projects. I’m just about finished with the board and batten we’ve put up in our entry and our bedroom, but the entire time my husband kept saying that the walls are fine and didn’t need to be changed! If he only knew that I want a planked wall in both bathrooms and in our guest bedroom…LOL! You bathroom is so gorgeous with the new wall and the overall changes you’ve made. You did good! Will you be listing the cabinet color? Love the redo. This is almost identical (minus the awesome tub and countertop) that I have planned for my main bath. Good job. It’s thorwood by Graham thanks Alyson! looks amazing. you are so funny! Thanks friend, can’t wait to see your Christmas tour, the ceilings look AMAZING! 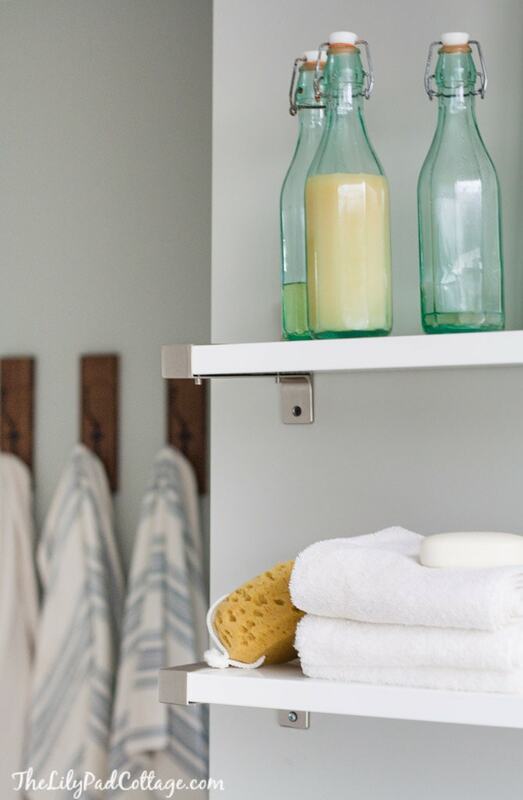 Ok, did you buy the hooks from Target already mounted on the wood, or did you already have the wood and mount the hooks to it? I couldn’t find the hooks at Target like yours. We have VERY limited wall space (like only about five inches worth next to the shower) in our bathroom, and I think hooks would work well. Never mind, found the hooks today! Yay! You are unbelievable! It is gorgeous . Did you remove the drywall o put up the boards over it? I want this look on my bedroom back wall. My invite is still open if you would like a beach vacation in Myrtle Beach. Maybe you could lend a hand?? LOL. Hope you are feeling better. Hey Beth, nope the planks went right over the drywall! Ask me about florida again when it’s January and I can’t feel my feet! I’m certainly glad that you’re feeling better and it was pure genius waiting for the Mr. to go out of town before tackling such a wonderfully creative project. Males have a tendency to rain on our creative parade. Now, my hubby decided he would quash any superior ideas on my part. He gave ALL of his wood working tools to our sons. Now any time I ask for anything to be done he says he doesn’t have the tools — name of one of our sons has it. :-( That was pretty sneaky of him. I have so many little things I want him to do — especially making me backgrounds for my food staging. I just may have to get him so wood working tools for Christmas :-) heh!heh!heh! Beautiful makeover. I love following along on your blog as you remind me a bit of myself, and waiting for my husband to go out of town is something I totally do! My bathroom is also in need of a refresh (15years), and I feel like it will be a project for this winter, just not sure where I’ll send my husband. 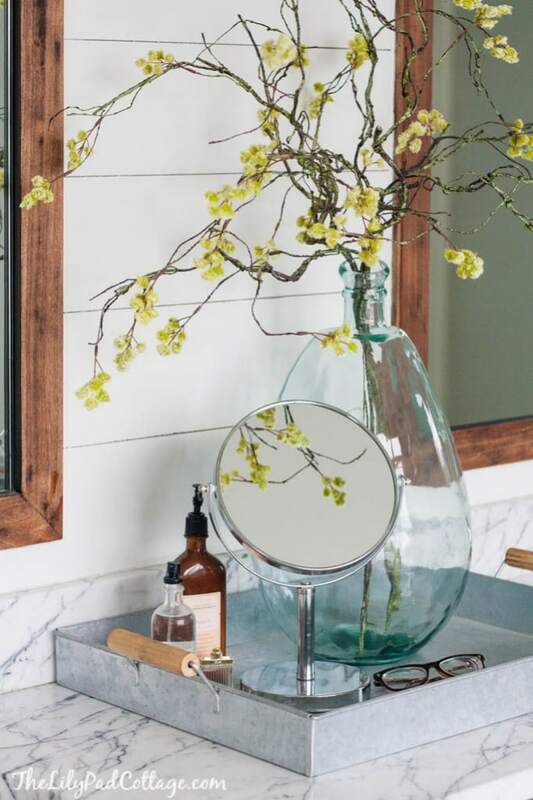 ;) and your bathroom will definitely be on my inspiration board! Ha good luck with your bathroom Janie, thanks for reading! Wow, you are amazing! I’m sure I would have quit working, laid in bed feeling sorry for myself and totally ticked off the husband when he came home to an unfinished project. ;). I love the planked wall and the contrast of the warm wood mirror frames. Can’t wait to hear more about the lights! 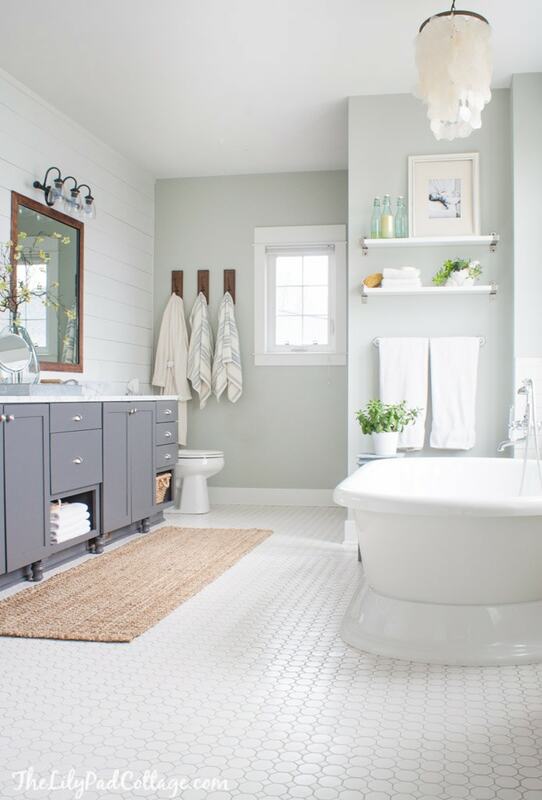 You are motivating me to get started on a master bath makeover that has been brewing in my brain! Thanks Kimm, I just can’t stand leaving something unfinished, it’s a blessing and a curse I think ha! You are totally a rock star …..beautiful transformation 😊You didn’t mention the color of the cabinets ? Will you share , please ! Thorwood by Graham paint thanks Bev! Been there done that, many times. When hubby was going to be away, sometimes as much as 6weeks, I would call the interior decorator in advance and have the project all planned out so that her crew came into the house as soon as hubby left. By the way, I’m still laughing. Love your sense of humor. Hubby definitely hates any in house project. We had a horrific storm that tore the roof up and caused water to drip down the foyer wall so I said we needed to paint. His comment was “no one will notice” I had to wait until another one of his trips, then had everything painted, not just the foyer. You know what he said everytime when he came home? “That looks nice”. How exactly did you plank you walla if you dpoint mind me asking? Did you have to out anything in them before painting to keep the wood from molding? Thanks your bathroom looks awesome !! I always suspected you were a crazy lady and now I know for sure Kelly. But at the same time, I love your shutzpah! Love, love, love the transformation. Please take better care of yourself. Ha thanks I’m a bit crazy when I have a project in my head that’s for sure! I love this look. 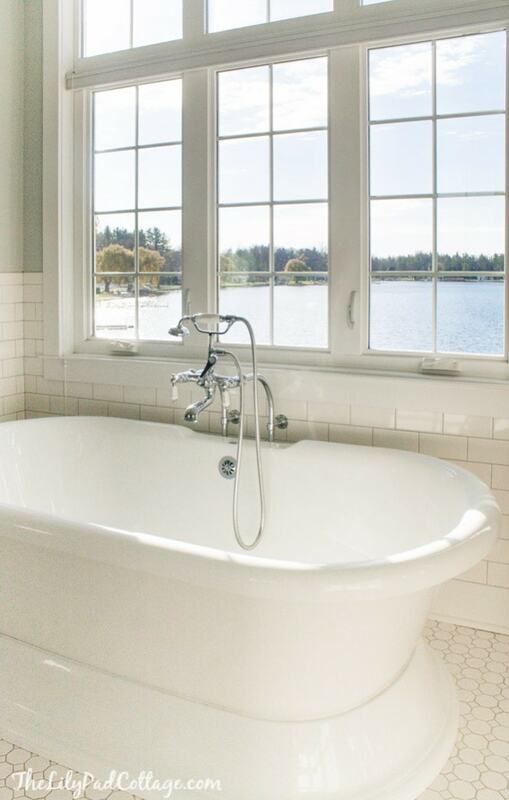 Love that view from the tub. I was thinking of doing this in my Kitchen, I think you just sold me on this idea. Love it. Oh it would look great in a kitchen! Good luck Gail! You are a riot…and so talented! Looks awesome! 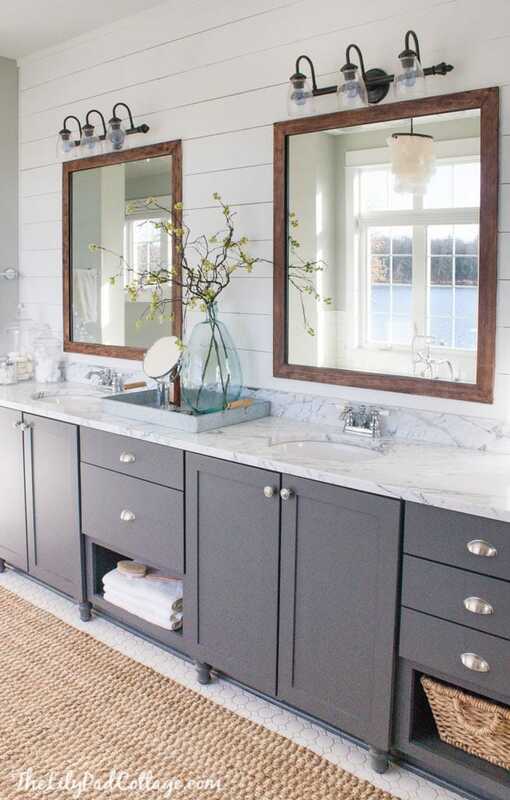 Quick question…how come you can’t see any seams on the shiplap wall? It looks longer than 8′ across? I love what you have done in there! Hey Tracey, so I actually cut the boards to go between the mirrors because they are glued to the wall. So there were no seams until above the mirrors and then it looked kind of weird, so I used spackle to fill in the seams. Thanks so much for the info! I really love the look, and you did an outstanding job! Lets just put it out there… YOU are fantastic! Love everything. Can I ask where you bought your shelves? Are they Ikea? You got it, Ikea! Thanks Marilyn! I have been waiting for this post since you those adorable cabinet feet hooked me two weeks ago. Reading it at 10:30 last night inspired me so much I couldn’t sleep! The mix of insomnia, excitement, and two cups of coffee this morning have me bouncing in my seat. Are you still interested in receiving photos of rooms via email and helping me design something? Hey Jessica, oh man I remember when I put this out there about helping design rooms and then I underestimated how much time would be involved. At the moment my kids are keeping me too busy, maybe someday when little man is in school full time too! OOPS sorry see that you listed Ikea shelves. It’s Thorwood, or Thornwood by Graham I forget which one! Bathroom is lovely. I would love to have one that size, but my husband said when we rebuilt the house, “no one needs a large bathroom”. Now we are at the point where we have had to use a walker and I told him the door is coming off if we need a walker again. I always enjoyed the time I had when my husband was gone for a couple days. I got so much work done. Now in our 80’s he doesn’t go as much. I do have a bathroom job I want to do. I still have plastic tile and my husband “loves” it. I don’t know if that’s being frugal or what, but one of these days it will drop off. Hope you have had your last bug for the winter. Thanks Carol my Mr. is frugal too so I get it, thanks so much for reading! It is amazing as usual, Kelly! You are so creative and I love your sense of humor! I know you must get tired of hearing this all of the time – but you are without a doubt – ABSOLUTELY, POSITIVELY AMAZING!!!!! I would have given up just trying to locate a store to cut the boards, never mind doing all of the painting, nailing, electrical and cleaning up!!!!! It is fantastic looking – kudos to you!!!! I don’t know about amazing, completely obsessive possibly would be more accurate ha but thank you! That looks so much better! It is literally how that bathroom should have been from the get go. Love it! Thanks so much Jennie, we had a great Thanksgiving, hope you did as well! Gorgeous bathroom! 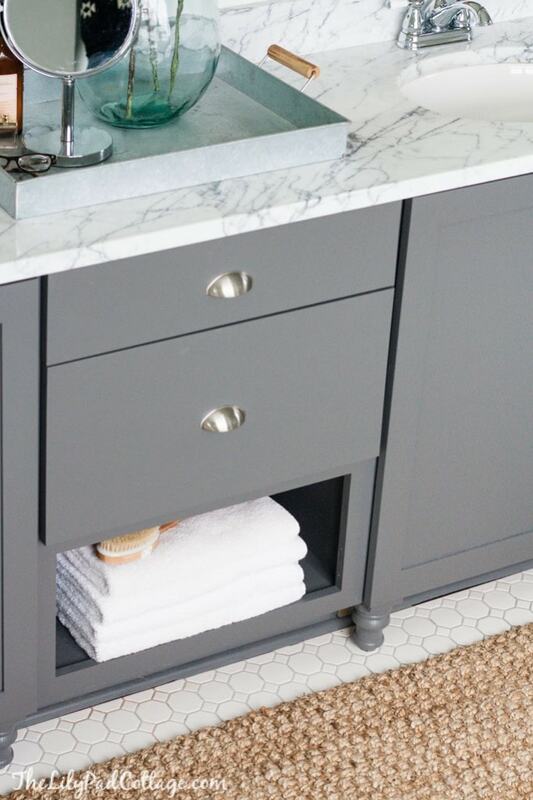 What kind/style of vanity top is that? It’s poured concrete, so cool! Wow!! Really? It looks like marble! So cool! How did you achieve the look? 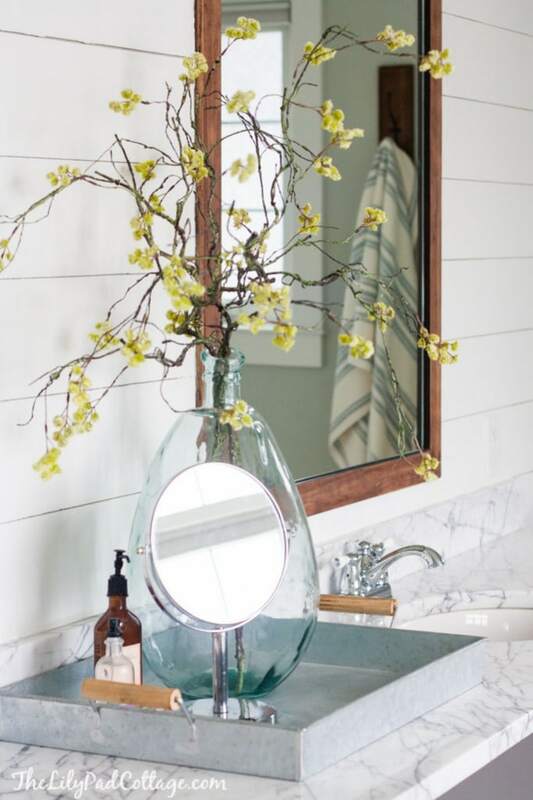 Gorgeous job on the bathroom! I’ve quickly read the article but didn’t see a source for the floor tile. Is it new? Do you know if it’s still available? How about the bathtub? What source is that? Thank you! Hey Jane we got the floor tile at Lowes 5 years ago so it may still be available? The tub we got at a local store 5 years ago as well sorry! Thank you for your posts! I love your home! What kind of wood did you use? My husband and I just bought a new home and he wants to shiplap everything. Haha. I don’t mind a good mix for a cottage/farm feel. Oh lucky you I wish my husband wanted to shiplap everything :) It’s just called underlayment I think? It’s a thin type of plywood, they will know what you are talking about at Lowes or wherever you go! Awesome, thanks! That’s what the hubby said we should use but I was afraid it would look cheap. Happy to see it doesn’t! Did you paint before you put them up or after? I painted after, way easier that way! Just keep something skinny around (I think i used a thin piece of cardboard) to run between the boards if paint gets trapped there. Just found you on Pinterest. You are an inspiration! 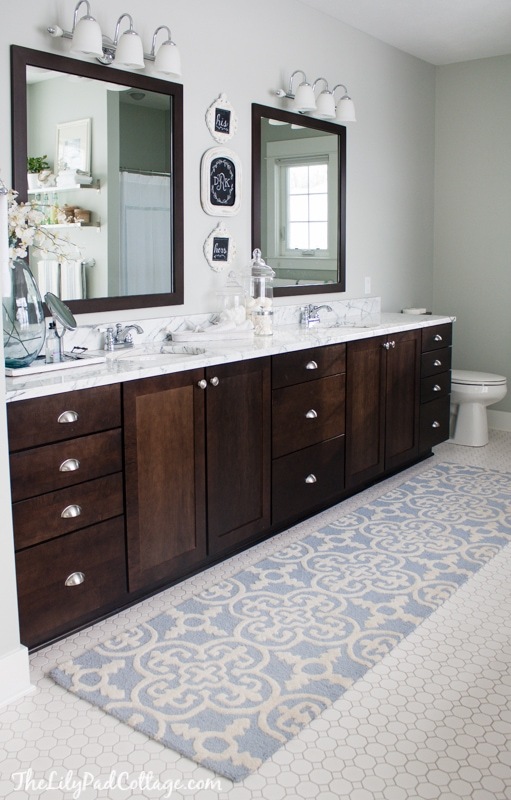 Love your finishing touches….. the hexagon tile floor, the ship-lap, the subway tile and the marble topped vanity. Do you have a shower? What type of flooring and wall tile would you use in a shower to tie into the rest of your bathroom? Im concerned that there wont be a sense of fluidity if I use too many materials. Hi Irene, we do have a shower it’s just a plain fiberglass stall. I would love to redo it some day and I would probably do it will subway tile to tie it all in. Maybe a smaller hex on the floor? I really love your bathroom! Where did you get the vanity lights? Your bathroom is beautiful! Where did you get the vanity light fixture? I would love to know where the lights and mirrors are from (above your vanity). Gorgeous everything!! Are those totally new light fixtures, or did you paint the existing ones and add new shades? If you reused the existing, where did you get those shades? Looking for some like that! I painted them and added new shades from Lowes. I came across your website while getting ideas for my bathroom Reno. I love your chandelier! I’ve been searching everywhere for a capiz light with no luck. Do you mind sharing where you purchased it? Beautiful work! It’s from Pottery Barn thanks! Where are your vanity lights from? Also did you frame the mirror or purchase that way? Thanks!! I read in the comments that your vanity counter top is poured concrete. How neat! How did you achieve that marbled look? It has to be cheaper than real marble ;) Thanks! whoops that must have been in reference to my parent’s master bathroom, this is actually real marble. Sorry for the confusion! Love this! Did you have to cut out spots for the light fixtures before hanging the wood panels? Yes I did. I took the light fixtures down traced the measured the hole and cut that into the board. Then put the light fixtures back up. 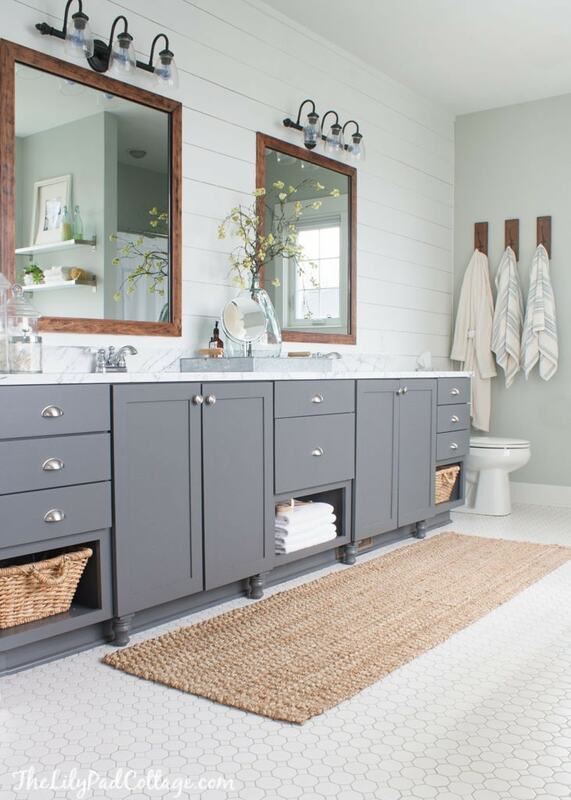 What color white did you use on the shiplap? Thanks! I think it was Silent White thanks! I am hoping to add the underlayment planks to my bathroom wall with the vanity and mirror, just like you did. I have a builder grade mirror (probably about the size of one of your mirrors) that I eventually plan on framing with stained wood strips after planking the wall behind it. I’m a bit nervous about removing the mirror without breaking it. Did you do this by yourself as well? Also, when you went to reattach the mirrors, how did you attach them? Are you still able to use a stud finder with the planks there? My mirror is currently held up with those basic plastic clips on top and the little flat metal ones on bottom against the granite backslash. I’m pretty sure they are removable because the granite guy was here recently and had to take them down and reinstall them at the time. Thanks again! did you frame your mirrors yourself or purchase them?! Our contractor framed them for me. Hi I am new to your blog and am so impressed! My bathroom is in such a sorry state…looking to do a DIY as much as possible as we have a kid going to college in a year. 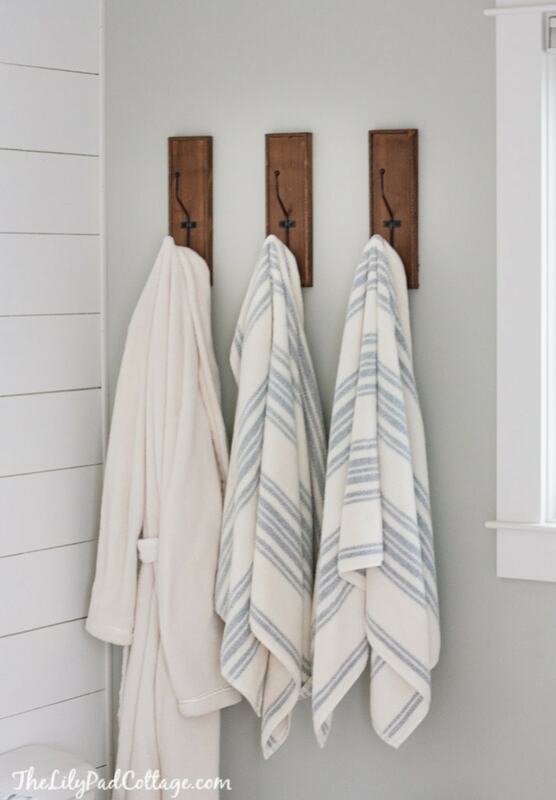 Can you please help me find the instructions for the shiplap wall? Also, any thoughts about continuing the shiplap treatment behind/surrounding the tub? Our layout is similar to yours. I’ve never tiled before, but I am thinking I could probably handle the tiling and shiplap…any help/guidance in either area is much appreciated! Love the whole room. May I ask what paint color you used on the walls? Hi there. What size is that jute rug from World Market? I love it and would like to have the same one in my guest bathroom. Thanks! It’s an 8 foot runner thanks! Love this!! What are the dimensions of your mirrors I know you said the contractor framed them but I’m hoping to buy some already frames and just wondering on size!!!! Thanks so much!!! Hi Stephanie I’m not sure on the dimensions because this is from our old house so I can’t check for you – thanks! Love the final look, going to try this in our home, but had a few questions. 1. 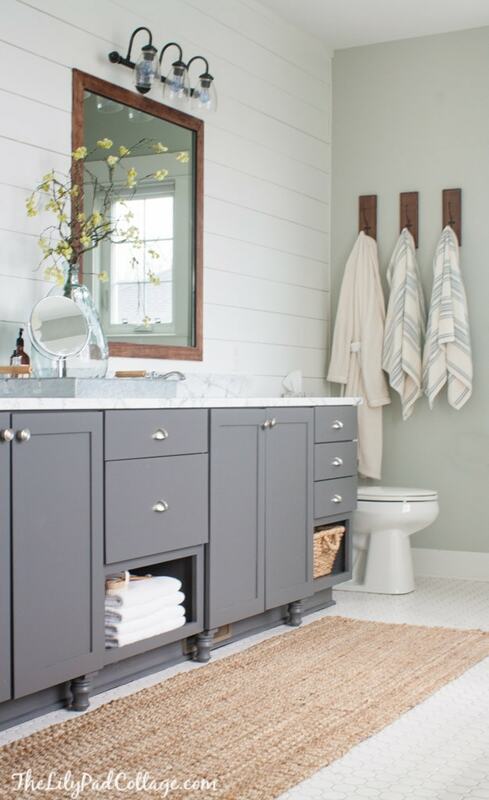 What color paint did you use on shiplap? 2. Did you have to caulk to prevent water damage! 3. How long were strips of ship lap you used? 4. 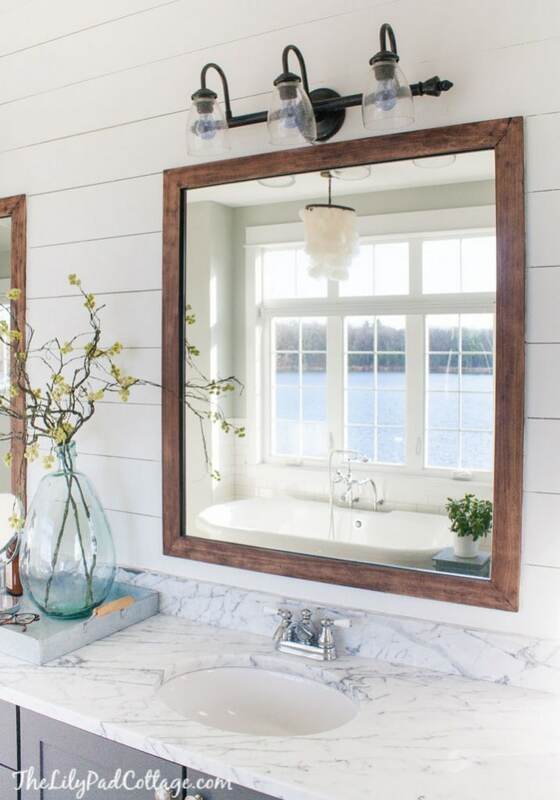 Difficult to install lighting/mirrors onto shiplap? Hi Michelle, I think I used satin paint on the ship lap but I’m not sure what color because this post is a few years old. I did caulk along the bottom. I think the ship lap was 8 ft? The shiplap is so thin as long as you cut the hole in the right spot for the light fixture it wasn’t difficult. Good luck! Hello! Just wondering where you got the lights from?? Hello,,, I’m looking for where you found your vanity, I have a large bath room and having such a hard time finding the length I need. I ordered these from a cabinet company – thanks! Beautiful! Can you please tell me what stain you used on the frames around your mirrors? Hey Whitney I’m not sure, this post is from a few years ago – sorry! Can you tell me where you got your vanity lights? I love them! These were old from Lowes that I spray painted and switched out the globes so it was kind of a DIY – thanks!